At 4:30 a.m. PDT on Saturday June 26, the full moon rides low in the southwestern sky of San Francisco. The constellation Sagittarius forms its backdrop. The partial eclipse, which will be at maximum in 8 minutes, is already covering much of the moon. Full Story. Thefull moon of June will rise over Earth on Saturday, only to fall into a partiallunar eclipse as it passes through part of our planet's shadow. Becauseof the mechanicsof the moon, it will set around 5:30 a.m. EDT (0930 GMT), so observers inthe western and central parts of North America will have a better view ofJune's full moon, and the partial lunar eclipse that precedes it. 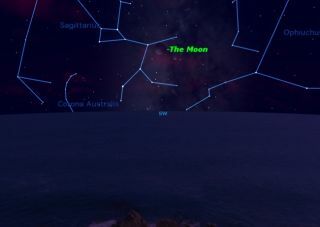 Thefull moon will be located in the constellation Sagittarius, very close to thesouthernmost point in its monthly journey around the Earth. Asa result, the moon spends less time than average above the horizon and nevergets very far above the horizon, as seen from the Northern Hemisphere. Thepartial lunar eclipse will obscure just over half of the full moon. SPACE.comskywatching columnist Joe Rao said in his guideto the June 26 lunar eclipse that the event should last for several hours(2:50 a.m. to 6:25 a.m. Pacific Time). Weatherpermitting, the moon is visible most nights at some point and is the brightestobject in the night sky. It is also visible in daylight much of the month,though most modern humans may be unaware of it. Afull moon is the most striking of the lunar phases. At this time, a seeminglyhuge moon rising in the east, fully illuminated, just as the sun is setting inthe west. Thelarge size of the full moon is actually an optical illusion, known as ?the moonillusion.? It is caused, some scientists think, by our mind?s attempt to makesense of the moon in relation to earthly objects on the horizon. In fact, thefull moon on the horizon is no larger than the moon at any other time orlocation. Youcan verify the moon illusion yourself by holding a small object, such as apencil eraser at arm's length and compare its size to that of the rising moon. Thengo back out a couple hours later, when the moon is higher and seems smaller,and make the same comparison to the eraser. Alternately, you can take twopictures of the moon, with your camera at the same settings, then print andcompare them. Theexact time of a full moon is determined strictly by the geometry of the sun,Earth, and moon: all three fall in a straight line with the Earth in themiddle. This is an instantaneous event, and happens at the same instanteverywhere in the world. InJune's case, the event will occur after the moon has set in eastern NorthAmerica. These circumstances change as you move across the continent. InSan Francisco, the full moon occurs at 4:30 a.m. with the moon 12 degrees abovethe horizon. There, the partial lunar eclipse will be a fine sight up and downthe west coast of North America. Butin England, June's full moon occurs at 12:30 p.m. British Summer Time, with themoon far below the horizon. The moon itself is quite indifferent to where onEarth people are observing it from. Likethe full moon of every month, June's comes with a host of different names allaimed at chronicling the monthly event. Various peoples around the world gavespecial namesto the full moons throughout the year as a simple way of recognizing thepassage of time. Thebest known of these names are those used in the English language, but otherwell known naming systems are used by the Algonquian peoples of northeasternNorth America, the Hindus of India, and the widespread Buddhist religion. Inaddition to its Flower moon moniker, June's full moon also known as thestrawberry moon in Algonquian, Wat Poornima in Hindi, and Poson Poya in the Sinhala Buddhist tradition. Itis also known as honey moon, rose moon, hot moon, and planting moon. This article wasprovided to SPACE.com by StarryNight Education, the leader in space science curriculum solutions.